Objectives The measurement of quality of life (QoL) in elderly cancer population is increasingly being recognised as an important element of clinical decision-making and the evaluation of treatment outcome. This systematic review aimed to summarise the evidence of QoL during and after adjuvant therapy in elderly patients with cancer. Methods A systematic search was conducted of studies published in CINAHL plus, CENTRAL, PubMed, PsycINFO and Web of Science from the inception of these databases to December 2016. Eligible studies included RCTs and non-RCTs in which QoL was measured in elderly patients (aged 65 years or above) with stage I–III solid tumours who were undergoing adjuvant chemotherapy and/or radiotherapy. Because of the heterogeneity and the insufficient data among the included studies, the results were synthesised narratively. Results We included 4 RCTs and 14 non-RCTs on 1785 participants. In all four RCTs, the risk of bias was low or unclear for most items but high for detection. Of the 14 non-RCTs, 5 studies were judged to have a low or moderate risk of bias for all domains, and the other 9 studies had a serious risk of bias in at least one domain. The bias was observed mainly in the confounding and in the selection of participants for the study. For most elderly patients with breast cancer, the non-significant negative change in the QoL was transient. A significant increase in the QoL during the course of temozolomide in elderly patients with glioblastoma but a decreasing trend in QoL after radiotherapy was shown. This review also shows a uniform trend of stable or improved QoL during adjuvant therapy and at follow-up evaluations across the studies with prostate, colon or cervical cancer population. Conclusions This review suggests that adjuvant chemotherapy and radiotherapy may not have detrimental effects on QoL in most elderly patients with solid tumours. A systematic search of the published literature in major databases from their inception to December 2016 was conducted. The risk of bias and the methodological aspects of quality of life reporting in the included studies were assessed. The search of grey literature, unpublished studies, ongoing clinical trials and theses and dissertations were not conducted. The studies included in this review are mainly non-randomised controlled trials. The meta-analysis was not conducted to pool the data and the Grading of Recommendations Assessment, Develooment and Evaluation (GRADE) approach was not used to assess the quality of evidence of the included studies. In many countries, the incidence of cancer among older people is increasing. This increase can be attributed to the remarkable growth of the elderly demographic and the common pathophysiology of cancer and ageing.1 2 As a result, the demands for and the importance of broadening clinical trials to include older adults, incorporating geriatric-specific end points3 and integrating geriatric assessment to address the needs of individuals are also increasing.4 Although quality of life (QoL) is not formally a part of the geriatric assessment, the measurement of QoL in the elderly cancer population is increasingly being recognised as an important patient-reported outcome to complement the clinician’s evaluation of disease progression and the determination of the clinical benefit and the burden of cancer treatment, along with toxicity, survival and mortality rates. QoL is also considered a useful outcome measure to enhance patient-clinician communication and patient compliance in elderly patients with breast cancer during cancer treatment.5 In a short literature review, Wedding et al reported that elderly patients with cancer tend to perceive their QoL as more important than gains in survival when compared with younger patients.6 Nevertheless, our understanding of the effect of cancer treatment on the QoL of elderly patients remains very limited. Clinically, the decisions regarding cancer therapy and the clinical management of elderly patients with cancer may be complicated by their vulnerability to chemotoxicity and the pathological changes of ageing together with different considerations of the treatment benefit and harm margins, functional decline, tolerability and QoL issues. A univariate analysis by Extermann et al revealed an association of the QoL effect with dose modification of chemotherapy in older patients.7 The literature states that elderly patients with cancer are less likely than their younger counterparts to be treated with a full course of adjuvant chemotherapy and radiotherapy.8 Consideration should be given to approaches that can prolong life expectancy, but not at the expense of QoL and physical and psychological functioning. For cancers with an extremely poor prognosis, such as glioblastoma, the extension of survival is less clinically meaningful if the patient has a decline in QoL.9 Researchers have also suggested that QoL be used as the main end point to support clinical decision-making if different cancer treatments are equally effective in terms of survival.10 To the best of our knowledge, a systematic review of the effects of adjuvant therapy on the QoL of elderly patients with cancer has not yet been published. Therefore, we undertook a systematic review of the literature to summarise the evidence of global or overall QoL and other domains pertaining to QoL during and after adjuvant therapy in elderly patients with stage I–III solid tumours. We considered the following question: ‘Does the global or overall QoL during and after adjuvant chemotherapy and/or radiotherapy decline, maintain or improve from baseline in elderly patients with solid tumours in randomised controlled trials (RCTs) or non-RCTs?’ In this review, QoL refers to the health-related QoL of elderly patients, considering the corresponding global, physical, cognitive, psychological and social domains as affected by the adjuvant therapy. The methodology of this systematic review included a prespecified literature search strategy, inclusion and exclusion criteria, process for selecting studies, assessment of methodological quality of studies and data synthesis. The review protocol was not registered in an international registery. The conduct and reporting of this systematic review were in accordance with the planned review methods except for the addition of assessment of risk of bias (RoB) of the included studies using the Cochrane Risk of Bias tool for RCTs and Risk of Bias tool in Non-Randomised Studies of Interventions (ROBINS-I) for non-RCTs. A systematic electronic search of peer-reviewed English-language articles published in CINAHL plus (1937–2016), CENTRAL (1993–2016), PubMed (1996–2016), PsycINFO (1967–2016) and Web of Science (1900–2016) from the inception of these databases to December 2016 was conducted. The date last searched was in March 2017. Searches were limited to human studies published in English. A pilot search on CINAHL was performed to identify the relevant keywords contained in the title, abstract and subject descriptors. Three broad categories of concepts were searched: ‘elderly’, ‘cancer’ and ‘quality of life’. The search terms included (older* OR elder* OR geriatric OR gerontology* OR senior OR aged) AND (oncology OR cancer* OR neoplasm*) AND (quality of life OR QOL). The full electronic search strategy is presented in Appendix A. The reference lists of the included articles were also examined to identify additional eligible articles. We included RCTs and non-RCTs in which QoL was measured in elderly patients (aged 65 years or above) with stage I–III solid tumours who were undergoing adjuvant chemotherapy and/or radiotherapy. Non-RCTs include quantitative studies such as observational, before-and-after and longitudinal studies, in which the allocation of intervention (analogy of treatment) occurs during the course of the usual treatment decisions.11 12 We required that the baseline and at least one global or overall QoL data element during and/or after adjuvant chemotherapy and/or radiotherapy be collected and reported in the studies so as to allow an in-context comparison of before and after adjuvant therapy. Studies that covered heterogeneous age groups were included if a subgroup analysis was performed and reported for those aged 65 years or above. Studies were excluded if they involved patients with haematological malignancies, distant metastatic cancer or recurrent cancer without a separate analysis and report of solid tumours or non-metastatic/regional metastatic cancer. We also excluded case reports, qualitative studies, literature reviews, studies that evaluated surgical or procedure-related treatment and presented in abstract form. We screened articles obtained from keyword searching for duplicates electronically with End-Note and then manually. After duplicate removal, we assessed the remaining articles for eligibility based on titles and abstracts. We included studies in full-text screening if they were RCTs or non-RCTs, included elderly patients with stage I–III solid tumours who were undergoing adjuvant chemotherapy and/or radiotherapy, and reported QoL. We retrieved full-text articles if we considered the studies relevant and if there was insufficient information to determine eligibility. We then examined each full-text article against the inclusion and exclusion criteria of the review. We extracted data related to publication information, sample characteristics, type of cancer, type of adjuvant chemotherapy and/or radiotherapy, supportive care, QoL measurements and results, dropouts and authors’ conclusions. Functional status and comorbidities at baseline and therapy-related adverse effects (where reported) were also extracted because of concern that they might co-vary or confound with those of adjuvant therapy to alter the change of QoL. In this review, two reviewers (LEYT and TDRL) independently performed the literature search, eligibility assessments and study selection. The data extraction, methodological quality assessment and the RoB evaluation were conducted by CKKF and LEYT. Discrepancies and disagreements were discussed and resolved by consensus. Because of the variations in study design, cancer populations and QoL scales and the insufficient data among the included studies, a meta-analysis was deemed impossible, and the results were synthesised narratively taking into account of the RoB of individual studies. In addition, we report a change in QoL scores from baseline to the middle of and to the completion of adjuvant therapy, and to the post-treatment follow-up period of individual studies where data were available. We defined ‘0’ as no change, ‘↑’ denotes better QoL than baseline and ‘↓’ represents worse QoL than baseline. The effect size (ES) was also calculated for individual studies for which sufficient information was available: 0.2 to <0.5 was considered small, 0.5 to <0.8 moderate and ≥0.8 large. 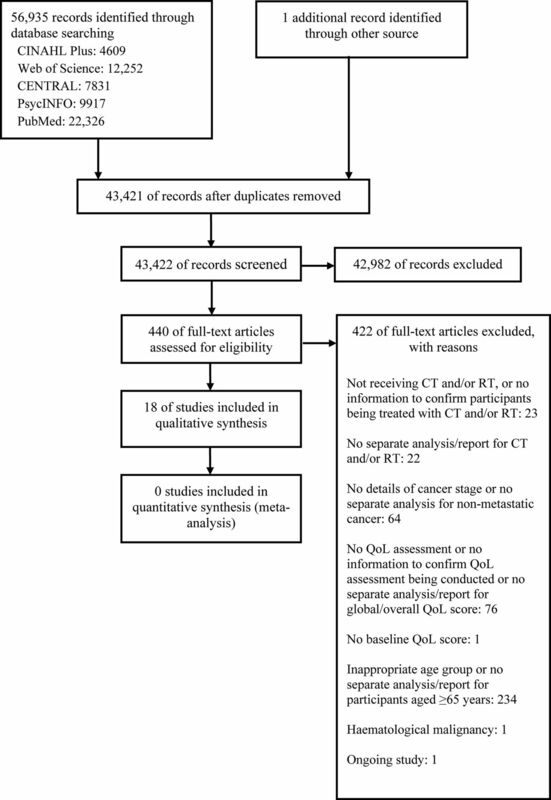 The initial search identified 56 935 articles, of which 440 were considered potentially relevant after checking for duplicates and title and abstract screening. After full-text assessment of the 440 articles, 18 met the eligibility criteria for inclusion in the review and analysis (figure 1).16–33 In most cases, the articles were excluded mainly because of the lack of QoL assessment during adjuvant therapy, a separate report of participants aged 65 years or above and/or a separate report of the QoL of participants who were undergoing adjuvant therapy or suffering from non-metastatic cancer. Study flow diagram. CT, chemotherapy; QoL, quality of life; RT, radiotherapy. Eleven studies were published between 2000 and 2009, and seven between 2010 and 2015. With respect to the country of origin, 10 were from Europe, 4 from the USA, 2 from South Korea and 1 from Canada; the other was a multicountry study. As for the study design, 13 studies were non-RCTs (before-and-after or longitudinal studies) that assessed the QoL of patients who were undergoing adjuvant chemotherapy,17 19 20 22 24 30 31 33 radiotherapy16 32 or concomitant chemotherapy and radiotherapy.26–28 Four were RCTs18 21 23 25; two of these compared the effects of different chemotherapy regimens on QoL, one study compared the effects of chemotherapy and hormonal therapy against those of hormonal therapy alone on QoL and the other compared the effects of radiotherapy and supportive care with those of supportive care alone on QoL. One was a validation study that involved a QoL evaluation of participants who were undergoing radiotherapy with or without hormonal therapy29 (table 1). The sample size of participants aged 65 years or older was reported by 17 of the 18 studies16–31 33; Caffo et al did not separately report the number of participants aged 65 years and older.32 The sample sizes ranged from 11 to 368 per study.16–31 33 In all, these 17 studies included 1785 participants; 764 participants from RCTs and 1021 participants from non-RCTs.16–31 33 Of these 1785 participants, 1633 completed the baseline QoL questionnaire; 671 participants from RCTs and 962 participants from non-RCTs. Furthermore, the baseline completion rates ranged from 64.7% to 100%. Where reported, the age range of the participants was 65–92 years.16 17 19 20 22 24–28 31–33 Eleven studies included participants aged 80 years and older.16 20 22 24 25 27 28 30–33 As for the cancer diagnosis, eight studies included participants with breast cancer,16–23 four studies focused on glioblastoma participants24–27 and two studies considered participants with colon cancer.30 31 We included one study each on mixed,28 prostate,29 cervical32 and lung cancer33 participants. The geriatric domains of functional status and/or comorbidities at baseline were examined and reported in 14 studies.16–18 20–27 29 31 33 As shown in table 2, two studies reported the mean score of the Karnofsky Performance Scale (KPS) as 90 or above,16 29 whereas three reported the median score of the KPS as 70 or above at baseline.25–27 A KPS score of <70 was used as a cut-off for the recruitment criterion in one study.24 Comorbid conditions were reported in eight studies16 17 20 21 23 26 31 33; six of these involved participants with a limiting comorbidity or with three or more comorbidities.16 17 21 23 31 33 Twelve studies measured cancer therapy-related toxicity during adjuvant therapy,16 18–21 23–26 31–33 and nine of these used National Cancer Institute’s Common Terminology Criteria for Adverse Events.16 20 21 23–26 31 33 With respect to haematological toxicity, two studies reported grade 3 or 4 toxicity in fewer than 10% of participants,18 31 and five reported such toxicity in 25% or higher during adjuvant chemotherapy or concomitant radiotherapy and chemotherapy.20 23 24 26 33 With respect to non-haematological toxicity, a study reported grade 3 or 4 toxicity in fewer than 10% of participants,18 and four reported such toxicity in 25% or higher during adjuvant chemotherapy or concomitant radiotherapy and chemotherapy20 23 26 31 (table 2). Thirteen studies attained scores of 10 or higher (high quality),16–27 33 three scored 7–9 (moderate quality)28 30 31 and two scored 6 or lower (low quality).29 32 The main methodological drawbacks of the included studies were the lack of determination of the prognostic factors for QoL (100%) and the lack of data on the time since diagnosis or treatment (77.8%) and the characteristics of non-responders (77.8%) (table 3). In all four RCTs, the RoB was low or unclear for most items but high for detection because of the subjective and self-reporting nature of the QoL assessment. One RCT did not blind the participants and staff and thus was judged to have a high risk of performance bias.18 The remaining three RCTs did not report information on the blinding of participants and personnel to allow for a judgement of the performance bias.21 23 25 We judged three RCTs to have an unclear risk of attrition bias because of the lack of explicit information on patients’ lost to follow-up and missing data18 21 25 (figure 2). 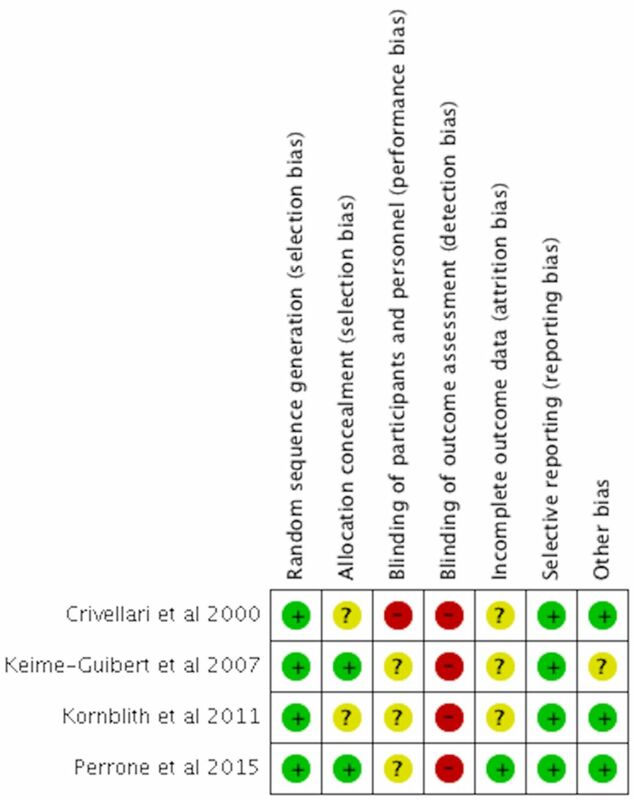 Risk of bias summary for randomised controlled trials. Of the 14 non-RCTs, five studies were judged to have a low or moderate RoB for all domains,16 20 26 31 33 and the other nine studies had a serious RoB in at least one domain.17 19 22 24 28–30 32 The bias were observed mainly in the confounding, in the selection of participants for the study and in the measurement of outcomes. Although most of the studies measured some confounding factors (eg, functional performance status or comorbidity) at baseline, no stratification in the study design or adjustment in the data analysis was made to control their effects.16 17 20 22–24 27 29 31 33 Four non-RCTs did not measure functional performance status or comorbidities at baseline.19 28 30 32 The bias in the selection of participants was either moderate or serious in all the non-RCTs.16 17 19 20 22–24 27–33 Only fit and functional elderly patients seemed to have been enrolled in these studies, and hence, the study cohorts might not be representative of the real-world population. Like the RCTs, all 14 non-RCTs had a moderate-to-serious RoB in the measurement outcomes because of the subjective and self-reporting nature of the QoL assessment. The bias in the selection of reported results was unclear in all the non-RCTs because of unavailability of study protocols16 17 19 20 22–24 27–33 (table 4). Three studies reported the global QoL scores at baseline, during chemotherapy, at the time of completion of chemotherapy and 4–12 months after the completion of chemotherapy.17 21 22 The participants in these studies were treated with the standard chemotherapy regimen for breast cancer, including an anthracycline-based, cyclophosphamide/methotrexate/fluorouracil (CMF) or fluorouracil/epirubicin/ cyclophosphamide regimen. In the study by Kornblith et al,21 approximately half of the participants received capecitabine. Browall et al reported statistically significantly lower global QoL scores during (ES, 0.74) and immediately after the completion (ES, 0.71) of chemotherapy than at baseline and a non-significant decline in the global QoL score 4 months after chemotherapy.17 Watters et al also revealed a statistically significantly lower global QoL score immediately after the completion of chemotherapy (ES, 0.66) than at baseline and a non-significant decline in the global QoL scores during and 6 months after chemotherapy.22 Browall et al and Watters et al also reported the domain scores, wherein statistically significantly lower scores in the role and social functioning domains were found immediately after the completion of chemotherapy than at baseline. No significant reductions in role and social well-being were reported during or 4–6 months after the completion of chemotherapy.17 22 Emotion was the only domain that showed an improvement from baseline to the follow-up evaluations, with a statistically significantly higher score during chemotherapy. The domains of physical and cognitive functioning revealed no statistically significant differences across time.17 22 In the study by Kornblith et al, both standard chemotherapy and capecitabine groups showed a decline in the global QoL during and immediately after the completion of chemotherapy, whereas an increase in the global QoL was reported from baseline to 12 months after the completion of chemotherapy21 (tables 2 and 5). In the context of cancer, QoL by its nature is a patient’s overall appraisal of the effect of cancer and its treatment. It is a patient-centred, relevant and key clinical parameter that can assist and support clinicians in setting goals and mapping avenues for effective and tolerable cancer treatment regimens beyond extending patient survival. Although the 18 studies included in this systematic review had somewhat heterogeneous study designs, cancer populations and measurement scales and reporting parameters of QoL to permit data pooling for a meta-analysis and precise estimation, our results provide some insights that will contribute to a better understanding of the effects of adjuvant chemotherapy and/or radiotherapy on the QoL of elderly patients aged 65 years or above. Our review suggests that QoL during and after adjuvant chemotherapy and/or radiotherapy is maintained or improved in most patients with solid tumours. Another finding of this review is the significant increase in the global QoL during the course of temozolomide treatment in elderly patients with glioblastoma (overall low or moderate to serious RoB),24 27 but a decreasing trend in QoL immediately after the completion of radiotherapy and 3 months after radiotherapy.25 26 Note that the studies by Gállego Pérez-Larraya et al and Minniti et al had substantial amounts of missing data (>40%), mainly because of the rapid progression of the disease in the glioblastoma population. However, the approach of complete case evaluation used in the final QoL analysis could have led to a systematic bias in the estimation of the true effect of adjuvant therapy on QoL towards high QoL scores. Therefore, some caution should be taken in the interpretation of the significant QoL improvement during the course of adjuvant therapy of elderly patients with glioblastoma. Nevertheless, attrition bias is always an issue in clinical trials involving QoL assessments and longitudinal follow-ups. This review suggests that a negative change in QoL was short-lived during adjuvant chemotherapy for some elderly patients with breast cancer. Adjuvant chemotherapy and radiotherapy may not have detrimental effects on global or overall QoL and other QoL domains in most elderly patients with solid tumours. These findings could be translated to help future elderly patients better understand the impact of adjuvant therapy on their QoL, and hence make better treatment decisions. Nevertheless, our review results should be viewed with caution because of RoB within and across the included studies. In addition, heterogeneity in study design and measurement of QoL, and lack of availability of data limit the pooling of data for meta-analysis and affect the robustness of the evidence synthesis. An attempt was made to contact the study authors for data, but without success. There is also a possibility of incompleteness of evidence because of unclear bias of the selection of reported result and the search of this review did not include grey literature, unpublished studies, ongoing clinical trials and theses and dissertations. Larger and well-designed studies of elderly patients in different cancer settings are warranted to validate these review results and to further build evidence to advance the current knowledge base. These studies should include and stratify elderly patients by functional status, comorbid conditions, geriatric syndromes and prognosis to be more representative of the real-world population and improve the research validity. Future studies should also include a detailed profile of the cytotoxic effects of chemotherapy and radiotherapy to allow a full exploration of the direct and indirect effects of adjuvant therapy on QoL. In future systematic reviews, if sufficient data are available, meta-regression should also be conducted to examine the association and interaction between the confounding factors and the QoL. The authors would like to thank Teo Desrene Rui Ling (TDRL), Research Assistant, for her work in literature search, eligibility assessments and study selection. International society of geriatric oncology. 2015 http://www.siog.org/.
. Cochrane Bias Methods Group Cochrane Statistical Methods Group. The Cochrane Collaboration’s tool for assessing risk of bias in randomised trials. BMJ 2011;343:d5928.
. The Perceived Adjustment to Chronic Illness Scale (PACIS): a global indicator of coping for operable breast cancer patients in clinical trials. Swiss Group for Clinical Cancer Research (SAKK) and the International Breast Cancer Study Group (IBCSG). Support Care Care 1993;1:200–8.
. Assessing symptom distress in cancer patients: the M.D. Anderson Symptom Inventory. Cancer 2000;89:1634–46.
. The EORTC QLQ-LC13: a modular supplement to the EORTC Core Quality of Life Questionnaire (QLQ-C30) for use in lung cancer clinical trials. EORTC Study Group on Quality of Life. Eur J Cancer 1994;30A:635–42. Contributors CKK-F, KR contributed to the conception or design of the work, and analysis and interpretation of data. CKK-F is responsible for drafting the manuscript. KR critically reviewed and revised the manuscript for important intellectual content. LEY-T contributed to the acquisition of data and critical revision of the manuscript for intellectual content. CKK-F, LEY-T, KR provided final approval of the version to be published.